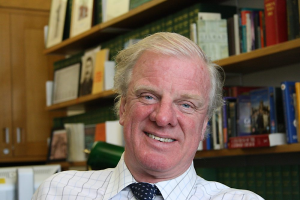 Sir Edward Leigh is a British politician. He has been a Conservative Member of Parliament since 1983. He is also the Chairman of the All-Party Parliamentary Group on France. Could you briefly go through your education and career? When did your life acquire a Franco-British dimension? Both my parents were brought up in France before the Second World War. My grandfather on my mother’s side was completely English but he was working in Paris as a lawyer and married a French lady. My mother went to school in Paris but they all had to leave France in June 1940 because the Germans were on their way to Paris. They took the boat in Cherbourg to go to England and my mother joined the WAAF [Women’s Auxiliary Air Force] which was the women’s RAF in the war and she met my father there. By coincidence, my father’s mother had also married a French man, a retired colonel from the French foreign legion. Therefore, both my parents spoke French fluently. I was educated in England but spent a couple of years at the French lycée, for my A-levels. What would you like to improve in Franco-British relations? Regarding Brexit, I think the British people have spoken and the decision is made. We would like Mr Macron to help us leave Europe in an amicable way. We would like a free-trade deal with Europe and with France. We hope to sign a quick deal on the money and on the rights of English people living in France and French people living in Britain. Because we have the same rules as the European Union, we could conclude this free-trade deal tomorrow, it is only a question of politics. Some forces in the European Commission would like to punish us but they are not punishing the government, they are punishing British people. Europe is supposed to be democratic and has to respect people’s views. People made that decision, for better or for worse. How do you promote Franco-British ties with the All-Party Parliamentary Group on France? The All-Party Parliamentary Group is a small group, we go to the Embassy occasionally and talk with the Ambassador. Once a year, we will hopefully go to France to meet French deputies at the Assemblée nationale and they will come here in return. We do not have any official status, the relations between the two Parliaments are very informal. There is no secretary, no reports. When the French deputies come to London, we sometimes arrange meetings with people they are interested in seeing, for instance the Defence minister or the Energy Minister. We had successful visits and there is a similar group which is being formed now at the Assemblée nationale. We hope to meet them in October. What do you like about the French political system and its Parliament? It would be interesting to see the new Assembly, very different from the old one. There is a lot of publicity about Mr Macron. We have been following the events carefully and are very interested in what he is trying to achieve with his pro-business agenda, by making it easier to employ and dismiss people. It may have an impact on us and particularly on the City of London if France becomes more business-friendly. Mr Macron is trying to attract some banks in Paris. But for the moment, the French Labour laws are so rigid that banks find it difficult to hire people in Paris. Mr Macron is an opportunity for France but could also be a threat to the British business community by making France a more pro-business place to set up. However, there might be massive demonstrations and strike as previously when attempts were made to reform the French Labour market. You mentioned the recent political changes at the French Parliament with the victory of Mr Macron’s party, do you think such changes are possible in the House of Commons? It would be quite difficult here. In the general election, we saw that the Conservative and Labour parties were very embedded in the community. The liberals have tried to destroy this equilibrium but totally failed. Of course, if there was a complete chaos with both parties having weak candidates and a central party growing up, it could be possible. There was a chance if Corbyn had not done better during the general election that the right-wing Labour MPs might have tried to create a central party. Now, with Corbyn’s good performance, it is not likely to happen. I do not think there will be an equivalent to Mr Macron here. All the regions in the UK have a regional Parliament and are represented at Westminster. Would a regional English Parliament be meaningful? Most of us do not think it is necessary because it is not in our tradition. There is no need for it. Some matters like education, health and transport are devolved to Scotland, Wales and Northern Ireland. An English Parliament would be boring. In France, we often hear comments about the irrelevance of the upper chamber, the Senate. Are English people also critical of the House of Lords? What is the relevance of the House of Lords nowadays? The House of Lords is too large with its 850 unelected people. Most of us think there should be a “haircut” as we call it, the size should be reduced by 200. The House of Lords is not a Parliament because it is not elected and cannot stop legislation. However it can reform it and it is full of experts. Legislation goes very quickly. On the contrary, The House of Lords is able to mull over it very slowly, to tweak and amend it. They do quite a good job and there is no enthusiasm for an elected house to replace the House of Lords. It would lead to more and more elected politicians, more expenses, and a rivalry with the House of Commons. Our French republican regime is described as a “presidential monarchy” by political analysts, due to the prerogatives of the President. As a citizen of a constitutional monarchy, what do you think? I believe France is a presidential monarchy. The French President is a very powerful figure. He is more powerful than the American President and the British Prime Minister, he can declare war and take decisions on his own without the Assemblée. In Britain, the Prime Minister must have the majority in his or her party and it is impossible to win an election on your own. It all depends on how many seats you win at the House of Commons. Mrs May has 318 supporters and there are 650 deputies in total. She hasn’t reached the magic number of 325, and therefore might not be totally free to act. In theory the other MPs could combine but in practice they never do. I think Mrs May is quite a presidential figure too. In the English Parliament, you have religious representatives whereas in France, public institutions are secular. Do you think religion is bringing an interesting dimension to the parliamentary debate? Do you think the English Parliament should include representatives from other religions? There have always been 26 bishops in the House of Lords, since the 12th century. Originally, the House of Lords was composed of the important aristocrats and the large landowners. The abbots owned huge amounts of land and the bishops were very powerful. 26 bishops is a very harmless number compared to the total number of 850. I do not think many people want to get rid of them, they are part of an unelected Chamber which does not have a lot of power. It is a remnant of the past and it is quite nice to have them in the House of Lords. They can speak from a religious moral point of view. Of course, it would not be understood in France with the separation between Church and State, but in England, we have an established Church. It is not unreasonable to have bishops in the House of Lords. Regarding the openness to other religions, a chief rabbi and Muslims have been appointed. The catholic bishops do not want to be represented in the House of Lords. They have been offered place but refused. Under Canon Law, a catholic bishop is not allowed to be in a Parliament. Only Anglican bishops are represented. In the House of Lords, there are also hundreds of people who are not religious at all, whether they are atheists or agnostics. What do you like about French culture? All English people love France: the climate, the food, the wine, the history, the beautiful towns and villages. France is physically much larger than England. English people love going to France. Sometimes they can find French people difficult to get to know, but if you do not speak the language at all, it is of course not easy. However, a lot of young French people speak English now. France is very close to England, but truly different. You know immediately that you are in another country. It is quite nice really. Although England is an island, I think American people are much more insular than us, very few of them travel.